From exploring historical slave trade sites to immersing yourself in the ways of the Maasai people of the Serengeti, there’s an abundance of activities to enjoy and that’s without even mentioning other delights like Mount Kilimanjaro! With the travel industry and leading safari providers like tanzaniaodyssey.com offering more routes and flexible packages to suit a range of budgets, now is the time to jet off and embrace everything Tanzania has to offer. Aside from catching a glimpse on your favourite wildlife show, many people have never seen a lion up close; it’s a majestic sight, and the sound of its mighty roar is something you will never forget. The Ngorongoro Crater offers visitors the chance to experience the beauty of wildlife up close and you can also take in some of the finest local cuisine there as well. Have you got what it takes to climb one of the most famous mountains on the planet? Put your strength to the test as you slowly work your way up to the peak- you certainly won’t regret the hard work! At the top you get to witness the beauty of Tanzania from an entirely new perspective, take in the glaciers and snow, and embrace those spectacular sunrises. Zanzibar is home to some of the best beaches in Africa and their mesmerising appeal is unrivalled. The Indian Ocean is crystal clear while Kendwa and Nungwi around the North Coast give offer a fantastic view of sunsets over shallow waters. And if you get tired of the beaches, head over to food market at Stone Town to indulge in some fresh seafood and sugar cane juice. Tanzanian people have a contagious love for music. Local tunes, traditional songs, reggae beats and hip-hop can all be heard blaring out of bars, shops and vehicles and you can’t help but get involved. Wake up to the tunes of Hakuna Matata before you set off on safari, the soundtrack to an unforgettable African wildlife adventure. Tanzania has a culture that’s entirely different from anything you’ve ever experienced. People are generally friendly, warm-hearted and accommodating- and don’t be surprised by the spontaneity of the locals; some people may even burst into song around you! 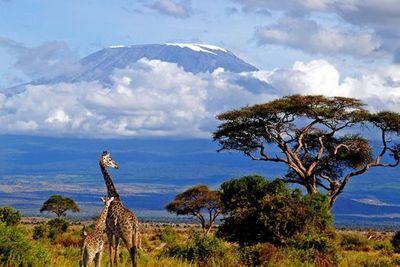 If you’re looking to experience real natural beauty, tackle the highest peaks and embrace a unique culture- travel to Tanzania: it really does have it all.